Microsoft 365 lets businesses subscribe to a bundle with Office 365, Windows 10 and the company’s mobile device management tools. The early focus for this program was enterprises, but a few months ago, the company also launched a preview version of Microsoft 365 for small and medium businesses. 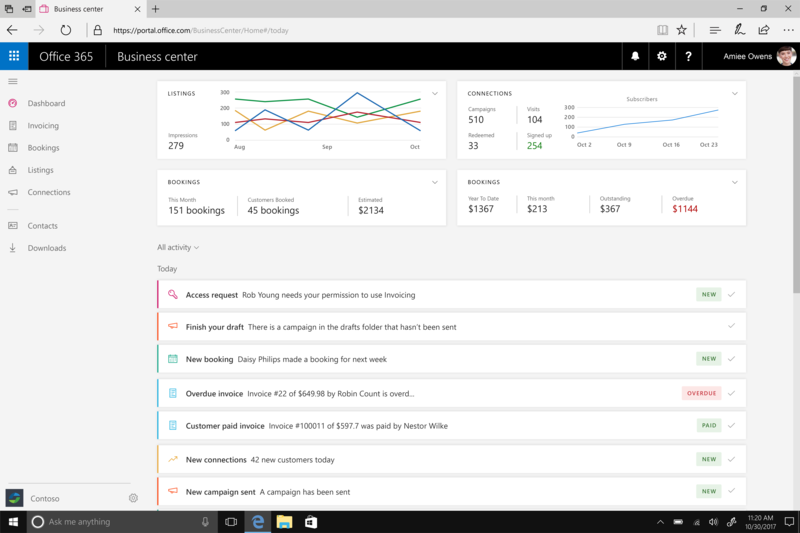 Today, Microsoft 365 Business is coming out of beta and is now generally available to customers. Also coming out of beta are the company’s tools for managing email marketing campaigns (Microsoft Connections), creating invoices (Microsoft Invoicing) and keeping tabs on a business’ online presence on search engines, social media and Yelp (Microsoft Listings). Like Microsoft 365 Business, these tools focus on specifically on the needs of small and medium businesses (SMBs) and they are now part of both the Microsoft 365 and Office 365 Business Premium subscription packages. Microsoft loves to talk about “digital transformation,” but it mostly does so in the context of large enterprise organizations. As Caroline Goles, Microsoft’s director of Office SMB, told me, the company recently looked at how it could apply its experience to SMBs as well. Given that most of these companies don’t even have a dedicated IT staff (or only a very small one), the challenges they face tend to be quite different and yet they also have to deal with much of the the same competitive pressure and security concerns as large businesses (only that even a small breach can easily bankrupt them). To tackle this market, the team combine Windows 10 and Office 365 with a simplified device management service that provides much of the power of its enterprise-class counterpart behind a far easier to use interface that provides sane default choices. All of this sits behind the so-called Microsoft Admin Console where users can easily provision new devices, allow access to files to certain users (or remove it), and manage other security settings. Among some of the smarter features here is the ability to protect company data behind an extra PIN code or fingerprint scan, as well as the ability to automatically delete data from a device if it hasn’t been used for a while. 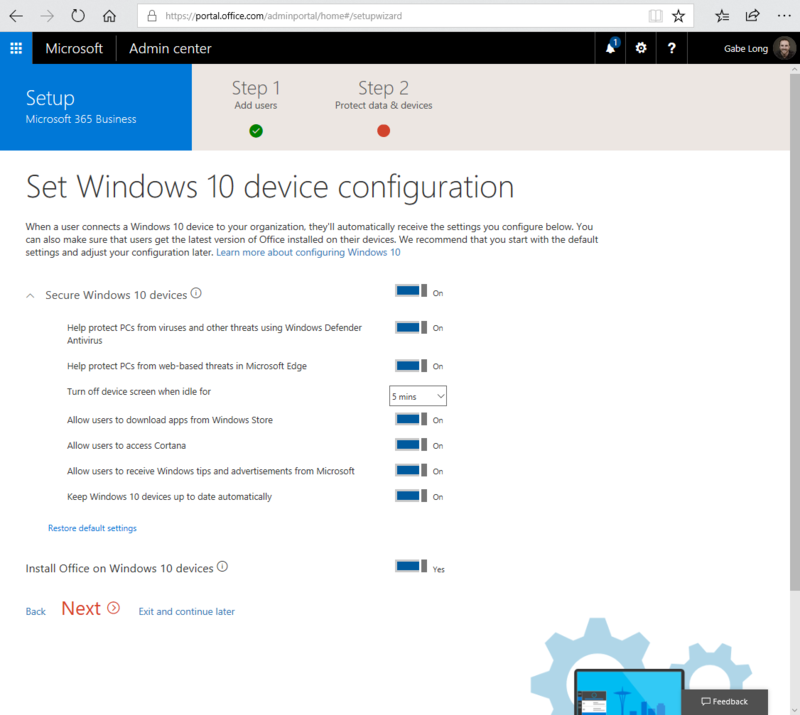 The Console also allows admins to ensure that Office 365 gets installed on every new machine, for example, and to enforce that Windows Defender is running on every laptop the company issues. The overall idea here is to simplify IT management for these businesses by giving them a single service for managing all of their technology needs. Goles noted that the addition of tools like Connections, Invoicing and Listings is part of the company’s goal to provide more services for the SMB market. These three tools join Microsoft Bookings, MileIQ and the Outlook Customer Manager in the company’s lineup of similar tools. For now, Microsoft doesn’t have any concrete plans to launch additional services on top of these business apps (or at least Goles didn’t share them with us), so for now, the plan is to ensure that the existing services meet the needs of Microsoft’s customers.